Common Name: Mugwort leaf, argy wormwood. Part Used & Method for Pharmaceutical Preparations: The leaves are gathered in spring or summer, when the mugwort is flowering. They are dried in a shady place. Meridians: Liver, spleen and kidney. Functions: 1. To warm the channels and stop bleeding; 2. To dispel cold and stop pain. 1. Hemorrhages due to deficiency and cold, especially uterine bleeding. 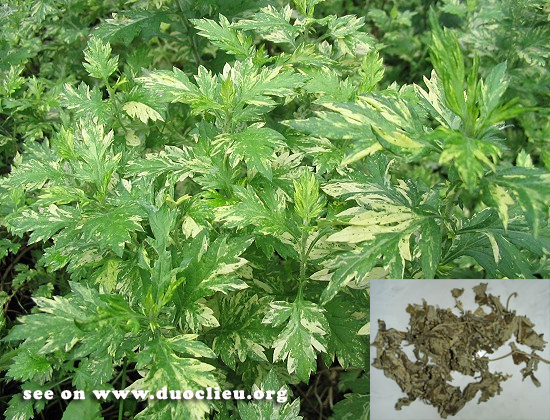 Mugwort leaf (Aiye) is used with Donkey hide gelatin (Ejiao) in the formula Jiao Ai Tang. 2. Deficiency and cold in the lower jiao manifested as abdominal cold pain, irregular menstruation, amenorrhea and leukorrhagia. Mugwort leaf (Aiye) is used with Chinese angelica root (Danggui), Cyperus tuber (Xiangfu), Chuanxiong rhizome (Chuanxiong) and Lindera root (Wuyao). 3. This herb can be used in a lotion form for eczema and pruritus, or burned on acupuncture points to warm Blood and Qi, and to relieve pain. Precautions: Contraindicated in patients with Yin Deficient Blood Heat.